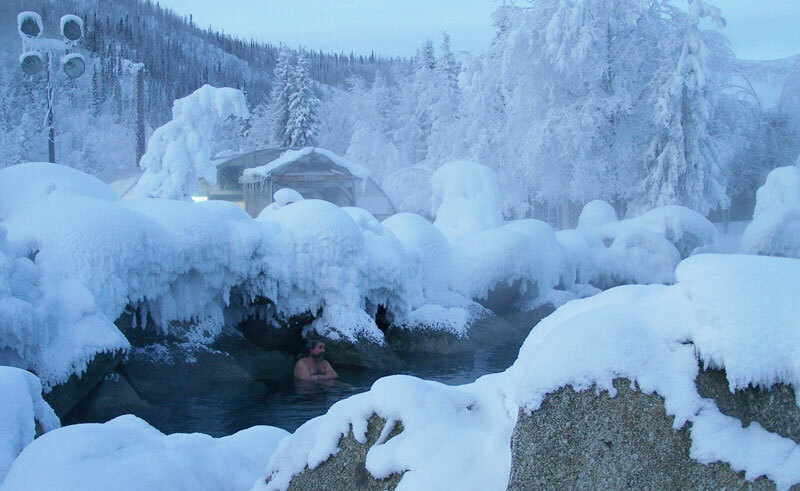 A welcome resort with healing mineral waters, Chena Hot Springs Resort was originally founded over 100 years ago and continues to attract people from all over the world to bathe in its warm mineral waters. Situated 60 miles northeast of Fairbanks, the geothermal energy that naturally heats the pools at Chena is also used to operate the resort’s year-round Aurora Ice Museum and Ice Bar. During your stay at Chena you can soak in the natural hot springs of Rock Lake or the outdoor hot tub, make use of the indoor family pool or book a massage treatment. A variety of activities are on offer (additional cost), including hiking, horse-riding and ATV-driving during the summer, and dog-sledding, snowshoeing and ice-skating in the winter. From late August until May you may be lucky enough to see the aurora borealis dancing overhead, and the resort’s remote location also allows for close encounters with wildlife during the summer months. Accommodation options at the resort include 40 spacious guestrooms in Moose Lodge, and 32 slightly smaller Signature Rooms. The rooms are simple, clean and comfortable. Family suites, yurts and camping facilities are also available. Fireside dining is on offer at the Chena Hot Springs Restaurant, whilst the Trails End lounge bar is the perfect place for a nightcap. Explore the wild beauty of Alaska during winter by car and train.